After filling 10 minutes with a best of the Men Tell All segment, the men of Rachel's season are brought out to the stage. Whaboom vs. Lucas is briefly touched upon before moving on to Demario and his "side chick" back home (his words, not mine) and Iggy being a snitch. Dean gets called to the hot seat eventually, rocking a dapper purple camouflage dinner jacket. Dean is very appreciative that his father accepted to call to allow a hometown date and this also allowed him to address his repressed feelings. Dean genuinely felt like he was falling in love with Rachel, but now is ready to move on and to which he will/did in Mexico... ooooon Paradise! The biggest drama of the season is Kenny and Lee, which impacted the vibe of the house and the experience of dating Rachel. Kenny felt their beef was never racial, just that Lee was "a dude out of his league." Kenny didn't appreciate Lee's putdowns or being labelled as aggressive since he's a father and wouldn't want do anything on this show that would shame his daughter. Kenny's daughter is very proud and joins him on stage, then gets very excited at the birthday surprise to send Kenny and his daughter to Disneyland. Lee admits he lied about being pulled from the van and apologizes for not being a better man. Lee goes on about seeing how he needs to change, especially when the men call out Lee being delighted about instigating conflict. Dean calls out Lee for never apologizing previously on social media before and saving it for this show. But Chris Harrison puts Lee the most on blast, sharing his sexist and racist tweets, to which Lee pulls the "I have a lot to learn" line again. 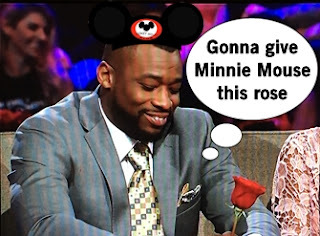 Josiah runs up to join Lee and ask why he would be on The Bachelorette with a black lead when he had so many derogatory comments. Lee says he hates racism but the guys don't understand why he never apologized for his tweets, which he eventually does apologize for after a looooot of discussion. Lee admits needing to learn and the guys offer to help, wrapping in a Kenny/Lee hug. Rachel is brought out to discuss her experience and face the questions of the men. Dean asks why Rachel would say she's falling in love with him then boot him days later. Rachel admits it's truly how she felt at the time. Rachel laughs about the Demario situation and that lying is a dealbreaker which is why he had to go. 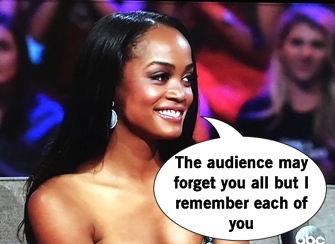 Rachel appreciates that race wasn't an issue while she was filming the season despite her status as the first African American Bachelorette. She admits being disappointed in Kenny letting the Lee drama overtake their potential connection. As for Lee, she hopes watching the show made him learn and if not she'll school him backstage. The unknown entities aka Adam and Matt weren't dragged by accident, they were victims of editing and Rachel hopes another woman will see how great they are. Frederick feels he never was given a fair chance because of knowing each other as kids but still respects her. And with that cathartic release, it's time for BLOOPERS!! 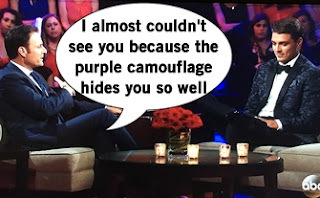 The Men Tell All ends with a recap of Rachel's final three with no sneak peek - lame! Who are you hoping will win? For me: anyone but Bryan.